The Right Honourable Sir Winston Leonard Spencer-Churchill, KG, OM, CH, FRS, PC (30 November 1874 – 24 January 1965) was a British statesman, best known as Prime Minister of the United Kingdom during the Second World War. At various times a soldier, journalist, author and politician, Churchill is generally regarded as one of the most important leaders in British and world history. He won the 1953 Nobel Prize in Literature. Churchill's legal surname was Spencer-Churchill, but starting with his father, Lord Randolph Churchill, his branch of the family always used just the name Churchill in public life. Born at Blenheim Palace, near Woodstock, Oxfordshire. Winston Churchill was a descendant of the first famous member of the Churchill family, John Churchill, 1st Duke of Marlborough. Winston's politician father, Lord Randolph Churchill, was the third son of the 7th Duke of Marlborough; Winston's mother was Lady Randolph Churchill (née Jennie Jerome), daughter of American millionaire Leonard Jerome. Neither parent showed young Winston much affection or love. Churchill spent much of his childhood at boarding schools, including the Headmaster's House at Harrow School. He famously sat the entrance exam but on confronting the latin paper he carefully wrote the title, his name and the number 1 followed by a dot and could not think of anything else to write. He was accepted despite this, but placed in the bottom division where they were primarily taught English which he excelled at. Today at Harrow there is an annual Churchill essay prize on a subject chosen by the head of the english department. He was rarely visited by his mother, whom he virtually worshipped, despite his letters begging her to either come or let his father permit him to come home. He had a distant relationship with his father despite keenly following his father's career. Once, in 1886, he is reported to have proclaimed "My daddy is Chancellor of the Exchequer and one day that's what I'm going to be." His desolate, lonely childhood stayed with him throughout his life. He was very close to his nurse, Elizabeth Ann Everest (nicknamed "Woom" by Churchill), and was deeply saddened when she died on July 3, 1895. Churchill paid for her gravestone at the City of London Cemetery and Crematorium. Churchill did badly at Harrow, regularly being punished for poor work and lack of effort. His nature was independent and rebellious and he failed to achieve much academically, failing some of the same courses numerous times despite showing great ability in other areas such as maths and history, in both of which he was placed at times top in his class. But his refusal to study the classics undermined any chance of success at a school like Harrow. The view of Churchill as a failure at school is one which he himself propagated, probably due to his father's intense dislike of the young Winston and his obvious readiness to label his son a disappointment. He did, however, become the school's fencing champion. Churchill attended the Royal Military College at Sandhurst. Churchill then became a war correspondent in the second Anglo-Boer war between Britain and Afrikaners in South Africa. He was captured in a Boer ambush of a British Army train convoy and thrown into prison. However, he made a daring escape which made him something of a national hero. In the 1906 general election, Churchill won a seat in Manchester. In the Liberal government of Henry Campbell-Bannerman he served as Under-Secretary of State for the Colonies. Churchill soon became the most prominent member of the Government outside the Cabinet, and when Campbell-Bannerman was succeeded by Herbert Henry Asquith in 1908, it came as little surprise when Churchill was promoted to the Cabinet as President of the Board of Trade. Under the law at the time, a newly appointed Cabinet Minister was obliged to seek re-election at a by-election. Churchill lost his Manchester seat to the Conservative William Joynson-Hicks but was soon elected in another by-election at Dundee. As President of the Board of Trade he pursued radical social reforms in conjunction with David Lloyd George, the new Chancellor of the Exchequer. In 1910 Churchill was promoted to Home Secretary, where he was to prove somewhat controversial. A famous photograph from the time shows the impetuous Churchill taking personal charge of the January 1911 Sidney Street Siege, peering around a corner to view a gun battle between cornered anarchists and Scots Guards. His role attracted much criticism. The building under siege caught fire. Churchill denied the fire brigade access, forcing the criminals to choose surrender or death. Arthur Balfour asked, "He [Churchill] and a photographer were both risking valuable lives. I understand what the photographer was doing but what was the Right Honourable gentleman doing?" In 1911, Churchill became First Lord of the Admiralty, a post he would hold into the First World War. He gave impetus to military reform efforts, including development of naval aviation, tanks, and the switch in fuel from coal to oil, a massive engineering task, also reliant on securing Mesopotamia's oil rights, bought circa 1907 through the secret service using the Royal Burmah Oil Company as a front company. The development of the battle tank was financed from naval research funds via the Landships Committee, and, although a decade later development of the battle tank would be seen as a stroke of genius, at the time it was seen as misappropriation of funds. The battle tank was deployed ineptly in 1915, much to Churchill's annoyance. He wanted a fleet of tanks used to surprised the Germans under cover of smoke, and to open a large section of the trenches by crushing barbed wire and creating a breakthrough sector. However, he was also one of the political and military engineers of the disastrous Gallipoli landings on the Dardanelles during World War I, which led to his description as "the butcher of Gallipoli". When Asquith formed an all-party coalition government, the Conservatives demanded Churchill's demotion as the price for entry. For several months Churchill served in the non-portfolio job of Chancellor of the Duchy of Lancaster, before resigning from the government feeling his energies were not being used. He rejoined the army, though remaining an MP, and served for several months on the Western Front. During this period his second in command was a young Archibald Sinclair who would later lead the Liberal Party. I do not understand this squeamishness about the use of gas. We have definitely adopted the position at the Peace Conference of arguing in favour of the retention of gas as a permanent method of warfare. It is sheer affectation to lacerate a man with the poisonous fragment of a bursting shell and to boggle at making his eyes water by means of lachrymatory gas. I am strongly in favour of using poisoned gas against uncivilised tribes. The moral effect should be so good that the loss of life should be reduced to a minimum. It is not necessary to use only the most deadly gases: gases can be used which cause great inconvenience and would spread a lively terror and yet would leave no serious permanent effects on most of those affected. During this time (1919–21), he undertook with surprising zeal the cutting of military expenditure. However, the major preoccupation of his tenure in the War Office was the Allied intervention in the Russian Civil War. Churchill was a staunch advocate of foreign intervention, declaring that Bolshevism must be "strangled in its cradle". He secured from a divided and loosely organised Cabinet an intensification and prolongation of the British involvement beyond the wishes of any major group in Parliament or the nation – and in the face of the bitter hostility of Labour. In 1920, after the last British forces had been withdrawn, Churchill was instrumental in having arms sent to the Poles when they invaded Ukraine. He became Secretary of State for the Colonies in 1921 and was a signatory of the Anglo-Irish Treaty of 1921 which established the Irish Free State. In October 1922, Churchill underwent an operation to remove his appendix. Upon his return, he learned that the government had fallen and a General Election was looming. The Liberal Party was now beset by internal division and Churchill's campaign was weak. He lost his seat at Dundee to prohibitionist, Edwin Scrymgeour, quipping that he had lost his ministerial office, his seat and his appendix all at once. Churchill stood for the Liberals again in the 1923 general election, losing in Leicester, but over the next twelve months he moved towards the Conservative Party, though initially using the labels "Anti-Socialist" and "Constitutionalist". Two years later, in the General Election of 1924, he was elected to represent Epping (where there is now a statue of him) as a "Constitutionalist" with Conservative backing. The following year he formally rejoined the Conservative Party, commenting wryly that "Anyone can rat [change parties], but it takes a certain ingenuity to re-rat." During the General Strike of 1926, Churchill was reported to have suggested that machineguns be used on the striking miners. Churchill edited the Government's newspaper, the British Gazette, and during the dispute he argued that "either the country will break the General Strike, or the General Strike will break the country." Furthermore, he was to controversially claim that the Fascism of Benito Mussolini had "rendered a service to the whole world," showing as it had "a way to combat subversive forces" – that is, he considered the regime to be a bulwark against the perceived threat of Communist revolution. The Conservative government was defeated in the 1929 General Election. In the next two years, Churchill became estranged from the Conservative leadership over the issues of protective tariffs and Indian Home Rule. When Ramsay MacDonald formed the National Government in 1931, Churchill was not invited to join the Cabinet. He was now at the lowest point in his career, in a period known as "the wilderness years". He spent much of the next few years concentrating on his writing, including Marlborough: His Life and Times – a biography of his ancestor John Churchill, 1st Duke of Marlborough – and A History of the English Speaking Peoples (which was not published until well after WWII). He became most notable for his outspoken opposition towards the granting of independence to India (see Simon Commission and Government of India Act 1935). Soon, though, his attention was drawn to the rise of Adolf Hitler and the dangers of Germany's rearmament. For a time he was a lone voice calling on Britain to strengthen itself and counter the belligerence of Germany. Churchill was a fierce critic of Neville Chamberlain's appeasement of Hitler. He was also an outspoken supporter of King Edward VIII during the Abdication Crisis, leading to some speculation that he might be appointed Prime Minister if the King refused to take Baldwin's advice and consequently the government resigned. However, this did not happen, and Churchill found himself politically isolated and bruised for some time after this. At the outbreak of the Second World War Churchill was appointed First Lord of the Admiralty. In this job he proved to be one of the highest-profile ministers during the so-called "Phoney War", when the only noticeable action was at sea. Churchill advocated the pre-emptive occupation of the neutral Norwegian iron-ore port of Narvik and the iron mines in Kiruna, Sweden, early in the War. However, Chamberlain and the rest of the War Cabinet disagreed, and the operation was delayed until the German invasion of Norway, which was successful despite British efforts. In May 1940, directly upon the German invasion of France by a surprising lightning advance through the Low Countries, it became clear that the country had no confidence in Chamberlain's prosecution of the war. Chamberlain resigned, and Churchill was appointed Prime Minister and formed an all-party government. In response to previous criticisms that there had been no clear single minister in charge of the prosecution of the war, he created and took the additional position of Minister of Defence. He immediately put his friend and confidant the industrialist and newspaper baron Lord Beaverbrook in charge of aircraft production. It was Beaverbrook's astounding business acumen that allowed Britain to quickly gear up aircraft production and engineering that eventually made the difference in the war. Churchill's speeches were a great inspiration to the embattled United Kingdom. His first speech as Prime Minister was the famous "I have nothing to offer but blood, toil, tears, and sweat" speech. He followed that closely with two other equally famous ones, given just before the Battle of Britain. One included the immortal line, "We shall defend our island, whatever the cost may be, we shall fight on the beaches, we shall fight on the landing grounds, we shall fight in the fields and in the streets, we shall fight in the hills; we shall never surrender." The other included the equally famous "Let us therefore brace ourselves to our duties, and so bear ourselves that, if the British Empire and its Commonwealth last for a thousand years, men will still say, 'This was their finest hour.'" At the height of the Battle of Britain, his bracing survey of the situation included the memorable line "Never in the field of human conflict was so much owed by so many to so few", which engendered the enduring nickname "The Few" for the Allied fighter pilots who won it. His good relationship with Franklin D. Roosevelt secured the United Kingdom vital supplies via the North Atlantic Ocean shipping routes. It was for this reason that Churchill was relieved when Roosevelt was re-elected. Upon re-election, Roosevelt immediately set about implementing a new method of not only providing military hardware to Britain without the need for monetary payment, but also of providing, free of fiscal charge, much of the shipping that transported the supplies. Put simply, Roosevelt persuaded Congress that repayment for this immensely costly service would take the form of defending the USA; and so Lend-lease was born. Churchill had 12 strategic conferences with Roosevelt which covered the Atlantic Charter, Europe first strategy, the Declaration by the United Nations and other war policies. Churchill initiated the Special Operations Executive (SOE) under Hugh Dalton's Ministry of Economic Warfare, which established, conducted and fostered covert, subversive and partisan operations in occupied territories with notable success; and also the Commandos which established the pattern for most of the world's current Special Forces. The Russians referred to him as the "British Bulldog". However, some of the military actions during the war remain controversial. Churchill was at best indifferent and perhaps complicit in the Great Bengal famine of 1943 which took the lives of at least 2.5 million Bengalis. Japanese troops were threatening British India after having successfully taken neighbouring British Burma. Some consider the British government's policy of denying effective famine relief a deliberate and callous scorched earth policy adopted in the event of a successful Japanese invasion. Churchill supported the bombing of Dresden shortly before the end of the war; Dresden was primarily a civilian target with many refugees from the East and was of allegedly little military value. However, the bombing was helpful to the allied Soviets. Churchill was party to treaties that would redraw post-WWII European and Asian boundaries. These were discussed as early as 1943. Proposals for European boundaries and settlements were officially agreed to by Harry S. Truman, Churchill, and Stalin at Potsdam. The settlement concerning the borders of Poland, i.e. the boundary between Poland and the Soviet Union and between Germany and Poland, was viewed as a betrayal in Poland during the post-war years, as it was established against the views of the Polish government in exile. Churchill was convinced that the only way to alleviate tensions between the two populations was the transfer of people, to match the national borders. As he expounded in the House of Commons in 1944, "Expulsion is the method which, insofar as we have been able to see, will be the most satisfactory and lasting. There will be no mixture of populations to cause endless trouble... A clean sweep will be made. I am not alarmed by these transferences, which are more possible in modern conditions." The transfers were in the end carried out in a way which resulted in hardship and death for many of those transferred. Churchill opposed the effective annexation of Poland by the Soviet Union and wrote bitterly about it in his books, but he was unable to prevent it at the conferences. Although the importance of Churchill's role in World War II was undeniable, he had many enemies in his own country. His expressed contempt for a number of popular ideas, in particular public health care and better education for the majority of the population, produced much dissatisfaction amongst the population, particularly those who had fought in the war. Immediately following the close of the war in Europe, Churchill was heavily defeated at election by Clement Attlee and the Labour Party. Some historians think that many British voters believed that the man who had led the nation so well in war was not the best man to lead it in peace. Others see the election result as a reaction against not Churchill personally, but against the Conservative Party's record in the 1930s under Baldwin and Chamberlain. "Unless some effective world supergovernment for the purpose of preventing war can be set up ... the prospects for peace and human progress are dark ...If ... it is found possible to build a world organization of irresistible force and inviolable authority for the purpose of securing peace, there are no limits to the blessings which all men enjoy and share." Churchill was restless and bored as leader of the Conservative opposition in the immediate post-war years. After Labour's defeat in the General Election of 1951, Churchill again became Prime Minister. His third government – after the wartime national government and the short caretaker government of 1945 – would last until his resignation in 1955. During this period he renewed what he called the "special relationship" between Britain and the United States, and engaged himself in the formation of the post-war order. The crisis began under the government of Clement Attlee. In March 1951, the Iranian parliament (the Majlis) voted to nationalise the Anglo-Iranian Oil Company (AIOC) and its holdings by passing a bill strongly backed by the elderly statesman Mohammed Mossadegh, a man who was elected Prime Minister the following April by a large majority of the parliament. The International Court of Justice was called in to settle the dispute, but a 50/50 profit-sharing arrangement, with recognition of nationalisation, was rejected by Mossadegh. Direct negotiations between the British and the Iranian government ceased, and over the course of 1951, the British ratcheted up the pressure on the Iranian government and explored the possibility of a coup against it. U.S. President Harry S. Truman was reluctant to agree, placing a much higher priority on the Korean War. The effects of the blockade and embargo were staggering and led to a virtual shutdown of Iran's oil exports. Churchill's return to power brought with it a policy of undermining the Mossadegh government. Both sides floated proposals unacceptable to the other, each side believing that time was on its side. Negotiations broke down, and as the blockade's political and economic costs mounted inside Iran, coup plots arose from the army and pro-British factions in the Majlis. Churchill and his Foreign Secretary pursued two mutually exclusive goals. On one hand, they wanted "development and reform" in Iran; on the other hand, they did not want to give up the control or revenue from AIOC that would have permitted that development and reform to go forward. Initially they backed Sayyid Zia as an individual with whom they could do business, but as the embargo dragged on, they turned more and more to an alliance with the military. Churchill's government had come full-circle, from ending the Attlee plans for a coup, to planning one itself. The crisis dragged on until 1953. Churchill approved a plan, with help from U.S. President Dwight D. Eisenhower, to back a coup in Iran. The combination of external and internal political pressure converged around Fazlollah Zahedi. Over the summer of 1953, demonstrations grew in Iran, and with the failure of a plebiscite, the government was destabilised. Zahedi, using foreign financing, took power, and Mossadegh surrendered to him on 20 August 1953. The coup pointed to an underlying tension within the post-War order: the industrialised Democracies, hungry for resources to rebuild in the wake of World War II, and to engage the Soviet Union in the Cold War, dealt with emerging states such as Iran as they had with colonies in a previous era. On one hand, spurred by the fear of a third world war against the USSR and committed to a policy of containment at any cost, they were more than willing to circumvent local political prerogatives. On the other hand, many of these local governments were both unstable and corrupt. The two factors created a vicious circle – intervention led to more dictatorial rule and corruption, which made intervention rather than establishment of strong local political institutions a greater and greater temptation. In Malaysia, a rebellion against British rule had been in progress since 1948. Once again, Churchill's government inherited a crisis, and once again Churchill chose to use direct military action against those in rebellion while attempting to build an alliance with those who were not. He stepped up the implementation of a "hearts and minds" campaign and approved the creation of fortified villages, a tactic that would become a recurring part of Western military strategy in South-East Asia. (See Vietnam War). The Malayan Emergency was a more direct case of a guerrilla movement, centred in an ethnic group, but backed by the Soviet Union. As such, Britain's policy of direct confrontation and military victory had a great deal more support than in Iran or in Kenya. At the highpoint of the conflict, over 35,500 British troops were stationed in Malaysia. As the rebellion lost ground, it began to lose favour with the local population. While the rebellion was slowly being defeated, it was equally clear that colonial rule from Britain was no longer tenable. In 1953, plans were drawn up for independence for Singapore and the other crown colonies in the area. The first elections were held in 1955, just days before Churchill's own resignation, and by 1957, under Prime Minister Anthony Eden, Malaysia became independent. In 1953 he was awarded two major honours: he was invested as a Knight of the Garter (becoming Sir Winston Churchill, KG) and he was awarded the Nobel Prize for Literature "for his mastery of historical and biographical description as well as for brilliant oratory in defending exalted human values". A stroke in June of that year led to him being paralysed down his left side. He retired because of his health on 5 April 1955 but retained his post as Chancellor of the University of Bristol. In 1955, Churchill was offered elevation to dukedom as the first-ever Duke of London, a title he himself selected. However, he then declined the title after being persuaded by his son Randolph not to accept it. Since then, no people other than royalty have ever been offered a Dukedom in the United Kingdom. In 1956 Churchill received the Karlspreis (engl. : Charlemagne Award), an award by the German city of Aachen to those who most contribute to the European idea and European peace. In 1959 he became Father of the House, the MP with the longest continuous service. He was to hold the position until his retirement from the Commons in 1964. He became the first person to receive Honorary U.S. Citizenship in 1963. From 1941 to his death, he was the Lord Warden of the Cinque Ports, a ceremonial office. On 2 September 1908 at the socially desirable St. Margaret's, Westminster, Churchill married Clementine Hozier, a dazzling but largely penniless beauty whom he met at a dinner party that March (he had proposed to actress Ethel Barrymore but was turned down). They had five children: Diana; Randolph; Sarah, who co-starred with Fred Astaire in Royal Wedding; Marigold, who died in early childhood; and Mary, who has written a book on her parents. Clementine's mother was Lady Blanche Henrietta Ogilvy, second wife of Sir Henry Montague Hozier and a daughter of the 7th Earl of Airlie. Clementine's paternity, however, is open to healthy debate. Lady Blanche was well-known for sharing her favours and was eventually divorced as a result. She maintained that Clementine's father was Capt. William George "Bay" Middleton, a noted horseman. But Clementine's biographer Joan Hardwick has surmised, due to Sir Henry Hozier's reputed sterility, that all Lady Blanche's "Hozier" children were actually fathered by her sister's husband, Algernon Bertram Freeman-Mitford, better known as a grandfather of the infamous Mitford sisters of the 1920s. Churchill's son Randolph and his grandsons Nicholas Soames and Winston all followed him into Parliament. When not in London on government business, Churchill usually lived at his beloved Chartwell House in Kent, two miles south of Westerham. He and his wife bought the house in 1922 and lived there until his death in 1965. During his Chartwell stays, he enjoyed writing there, as well as painting, bricklaying, and admiring the estate's famous black swans. Aware that he was slowing down both physically and mentally, Churchill retired as Prime Minister in 1955 and was succeeded by Anthony Eden, who had long been his ambitious protégé. (Three years earlier, Eden had married Churchill's niece Anna Clarissa Churchill, his second marriage.) Churchill spent most of his retirement at Chartwell and in the south of France. In 1963 U.S. President John F. Kennedy named Churchill the first Honorary Citizen of the United States. Churchill was too ill to attend the White House ceremony, so his son and grandson accepted the award for him. On 15 January 1965 Churchill suffered another stroke – a severe cerebral thrombosis – that left him gravely ill. He died nine days later on 24 January 1965, 70 years to the day of his father's death. His body lay in State in Westminster Hall for three days and a state funeral service was held at St Paul's Cathedral. This was the first state funeral for a non-royal family member since that of Field Marshal Lord Roberts of Kandahar in 1914. As his coffin passed down the Thames on a boat, the cranes of London's docklands bowed in salute. The Royal Artillery fired a 19-gun salute (as head of government), and the RAF staged a fly-by of sixteen English Electric Lightning fighters. The state funeral was the largest gathering of dignitaries in Britain as representatives from over 100 countries attended, including French President Charles de Gaulle, Canadian Prime Minister Lester Pearson, other heads of state and government, and members of royalty. It also saw largest assemblage of statesmen in the world until the funeral of Pope John Paul II in 2005. It has been suggested it was Churchill's wish that, were de Gaulle to outlive him, his (Churchill's) funeral procession should pass through Waterloo Station. This is complete myth. Though of course President de Gaulle did indeed attend the service and the coffin departed for Bladon from Waterloo Station, there is absolutely no connection. In fact, Churchill did not plan his own funeral as commonly believed; he made a few suggestions, but there was a private committee which made the plans, and he was not on it. At Churchill's request, he was buried in the family plot at Saint Martin's Churchyard, Bladon, near Woodstock and not far from his birthplace at Blenheim. Because the funeral took place on 30 January, people in the United States marked Churchill's funeral by paying tribute to his friendship with Roosevelt because it was the anniversary of FDR's birth. On February 9, 1965, Churchill's estate was probated at 304,044 pounds sterling. Churchill was a prolific writer throughout his life and, during his periods out of office, regarded himself as a professional writer who was also a Member of Parliament. Despite his aristocratic birth, he inherited little money (his mother spent most of his inheritance) and always needed ready cash to maintain his lavish lifestyle and to compensate for a number of failed investments. Some of his historical works, such as A History of the English Speaking Peoples, were written primarily to raise money. Although Churchill was an excellent writer, he was not a trained historian. In his youth he was an avid reader of history but within a narrow range. The major influences on his historical thought, and his prose style, were Clarendon's history of the English Civil War, Gibbon's The History of the Decline and Fall of the Roman Empire and Macaulay's History of England. He had little interest in social or economic history; he saw history as essentially political and military, driven by great men rather than by economic forces or social change. 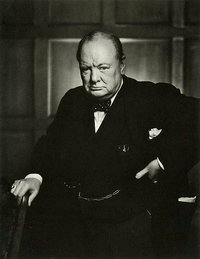 Churchill was the last (and one of the most influential) exponents of "Whig history" – the belief of the 18th- and 19th-century Whigs that the British people had a unique greatness and an imperial destiny, and that all British history should be seen as progress towards fulfilling that destiny. This belief inspired his political career as well as his historical writing. It was criticized as an old-fashioned view of history even in Churchill's youth, but he never modified it or showed any interest in other schools of history. Although he employed professional historians as assistants, they had no influence over the content of his works. Churchill's historical writings fall into three categories. The first is works of family history, the biographies of his father, Life of Lord Randolph Churchill (1906), and of his great ancestor, Marlborough: His Life and Times (four volumes, 1933–38). These are still regarded as fine biographies, but are marred by Churchill's desire to present his subjects in the best possible light. He made only limited use of the available source materials and, in the case of his father, suppressed some material from family archives that reflected badly on Lord Randolph. The Marlborough biography shows to the full Churchill's great talent for military history. Both books have been superseded by more scholarly works but are still highly readable. The second category is Churchill's autobiographical works, including his early journalistic compilations The Story of the Malakand Field Force (1898), The River War (1899), London to Ladysmith via Pretoria (1900) and Ian Hamilton's March (1900). These latter two were issued in a re-edited form as My Early Life (1930). All these books are colourful and entertaining, and contain some valuable information about Britain's imperial wars in India, Sudan and South Africa, but they are essentially exercises in self-promotion, since Churchill was already a Parliamentary candidate in 1900. Churchill's reputation as a writer, however, rests on the third category, his three massive multi-volume works of narrative history. These are his histories of the First World War – The World Crisis (six volumes, 1923–31) – and of The Second World War (six volumes, 1948–53), and his History of the English-Speaking Peoples (four volumes, 1956–58, much of which had been written in the 1930s). These are among the longest works of history ever published (The Second World War runs to more than two million words), and earned him the Nobel Prize for Literature. Churchill's histories of the two world wars are, of course, far from being conventional historical works, since the author was a central participant in both stories and took full advantage of that fact in writing his books. Both are in a sense, therefore, memoirs as well as histories, but Churchill was careful to broaden their scope to include events in which he played no part – the war between Nazi Germany and the Soviet Union, for example. Inevitably, however, Churchill placed Britain, and therefore himself, at the centre of his narrative. Arthur Balfour described The World Crisis as "Winston's brilliant autobiography, disguised as a history of the universe." As a Cabinet minister for part of the First World War and as Prime Minister for nearly all of the Second, Churchill had unique access to official documents, military plans, official secrets and correspondence between world leaders. After the First War, when there were few rules governing these documents, Churchill simply took many of them with him when he left office and used them freely in his books – as did other wartime politicians such as David Lloyd George. As a result of this, strict rules were put in place preventing Cabinet ministers using official documents for writing history or memoirs once they left office. The World Crisis was inspired by Lord Esher's attack on Churchill's reputation in his memoirs. It soon broadened out into a general multi-volume history. The volumes are a mix of military history, written with Churchill's usual narrative flair; diplomatic and political history, often written to justify Churchill's own actions and policies during the war; portraits of other political and military figures, sometimes written to further political vendettas or settle debts (most notably with Lloyd George); and personal memoir, written in a colourful but highly selective manner. Today these books are not in favour as historical references. As with all Churchill's works, they have little to say about economic or social history, and are coloured by his political views – particularly in regards to the Russian Revolution. But they remain highly readable for their narrative skill and vivid portrayals of people and events. When he resumed office in 1939, Churchill fully intended writing a history of the war then beginning. He said several times: "I will leave judgements on this matter to history – but I will be one of the historians." To circumvent the rules against the use of official documents, he took the precaution throughout the war of having a weekly summary of correspondence, minutes, memoranda and other documents printed in galleys and headed "Prime Minister's personal minutes". These were then stored at his home for future use. As well, Churchill wrote or dictated a number of letters and memorandums with the specific intention of placing his views on the record for later use as a historian. This all became a source of great controversy when The Second World War began appearing in 1948. Churchill was not an academic historian, he was a politician, and was in fact Leader of the Opposition, still intending to return to office. By what right, it was asked, did he have access to Cabinet, military and diplomatic records which were denied to other historians? What was unknown at the time was the fact that Churchill had done a deal with the Attlee Labour government which came to office in 1945. Recognising Churchill's enormous prestige, Attlee agreed to allow him (or rather his research assistants) free access to most documents, provided that (a) no official secrets were revealed, (b) the documents were not used for party political purposes, and (c) the typescript was vetted by the Cabinet Secretary, Sir Norman Brook. Brook took a close interest in the books and rewrote some sections himself to ensure that nothing was said which might harm British interests or embarrass the government. Churchill's history thus became a semi-official one. Churchill's privileged access to documents and his unrivalled personal knowledge gave him an advantage over all other historians of the Second World War for many years. The books had enormous sales in both Britain and the United States and made Churchill a rich man for the first time. It was not until after his death and the opening of the archives that some of the deficiencies of his work became apparent. Some of these were inherent in the unique position Churchill occupied as a historian, being both a former Prime Minister and a serving politician. He could not reveal military secrets, such as the work of the code-breakers at Bletchley Park (see Ultra) or the planning of the atomic bomb. He could not discuss wartime disputes with figures such as Dwight Eisenhower, Charles de Gaulle or Tito, since they were still world leaders at the time he was writing. He could not discuss Cabinet disputes with Labour leaders such as Attlee, whose goodwill the project depended on. He could not reflect on the deficiencies of generals such as Archibald Wavell or Claude Auchinleck for fear they might sue him (some, indeed, threatened to do so). Other deficiencies were of Churchill's own making. Although he described the fighting on the Eastern Front, he had little real interest in it and no access to Soviet or German documents, so his account is a pastiche of secondary sources, largely written by his assistants. The same is true to some extent of the war in the Pacific except for episodes such as the fall of Singapore in which he was involved. His account of the U.S. naval war in the Pacific was so heavily based on other writers that he was accused of plagiarism. The real focus of Churchill's work is always on the war in Western Europe, the Mediterranean and North Africa, but here his work is based heavily on his own documents, so it greatly exaggerates his own role. He had little access to American documents, and even those he did have, such as his letters from Roosevelt, Truman and Eisenhower, had to be used with caution for diplomatic reasons. Although he was, of course, a central figure in the war, he was not as central as his books suggest. Although he is usually fair, some personal vendettas are aired – against Stafford Cripps, for example. The Second World War can still be read with great profit by students of the period, provided it is seen mainly as a memoir by a leading participant rather than as an authoritative history by a detached historian. The war, and particularly the period between 1940 and 1942 when Britain was fighting alone, was the climax of Churchill's career, and his personal account of the inside story of those days is unique and invaluable. But since the archives have been opened far more accurate and reliable histories have been written. Churchill's History of the English-Speaking Peoples was commissioned and largely written in the 1930s when Churchill badly needed money, but it was put aside when war broke out in 1939, being finally issued after he left office for the last time in 1955. Although it contains much fine writing, it shows Churchill's deficiencies as a historian at their most glaring. It is generally regarded as tendentious and very old-fashioned, seeing world history as a one-dimensional pageant of battles and speeches, kings and statesmen, in which the English occupy central stage. Events viewed by today's historians as being of central importance, such as the industrial revolution, are scarcely mentioned. Although Churchill's enormous prestige ensured that the books were respectfully received and sold well, they are little read today.